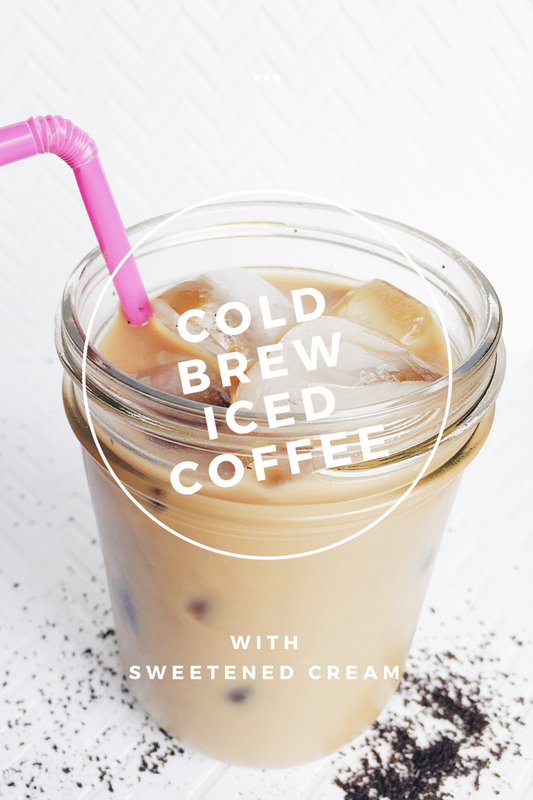 It’s that time of year where a hot cup of coffee just isn’t cutting it anymore and the only thing to give me my morning jolt, while staying cool, is a cup of this Cold Brew Iced Coffee with Sweetened Cream. 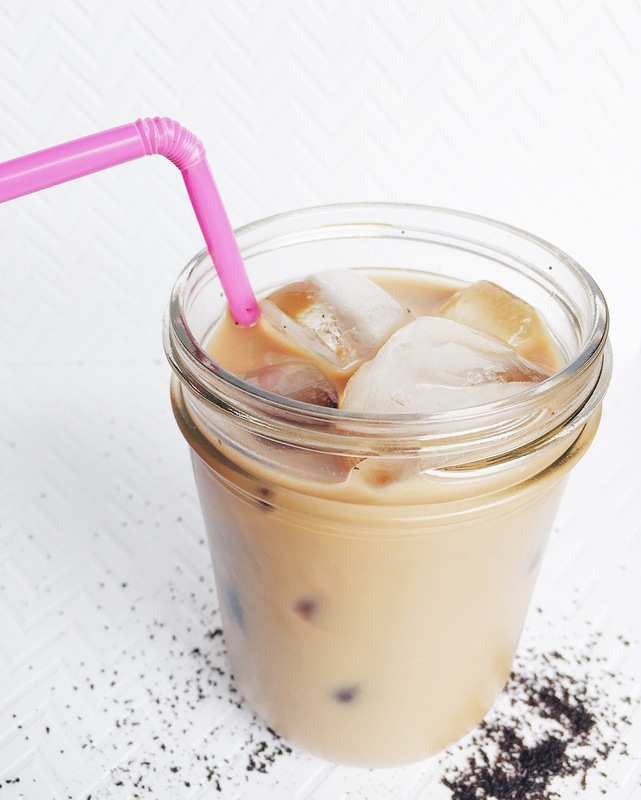 I jumped on the cold brew iced coffee bandwagon a few years ago when I got one of the Pioneer Woman’s cookbooks and saw she had a recipe to make cold brew coffee that looked so easy. After making it once I was hooked and have made it a bunch of times since! 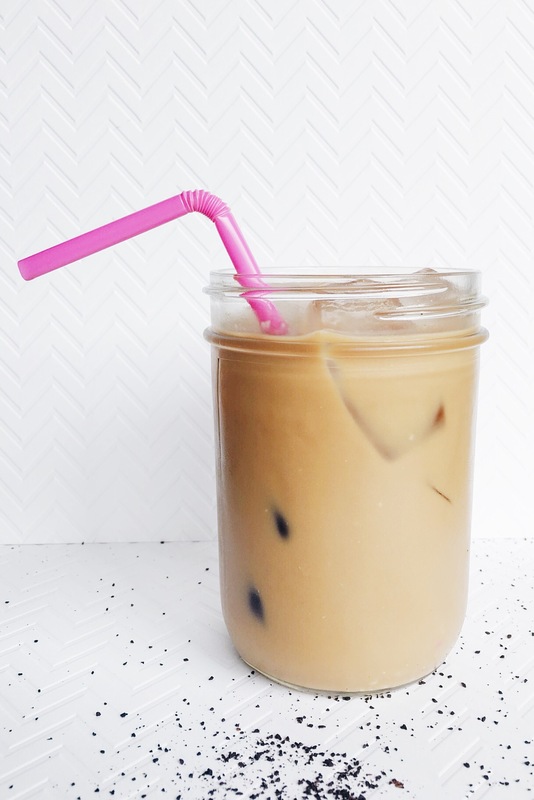 This cold brew coffee recipe is more of a concentrate than a straight iced coffee recipe, thus I created the Sweetened Cream recipe to go along side for the perfect cup of iced coffee. I’ve changed up the cold brew coffee recipe a little to make it work for me by tweaking the amounts of coffee to water ratio. In Pioneer Woman’s recipe she calls for the use of a giant container that holds 8 quarts of water (=32 cups). I definitely don’t have a kitchen container that size and also I don’t have room for 32 cups of coffee in my fridge, thus I had to make it my own and scale it down a bit. Making your own sweetened cream is simple and gives you the ability to customize your own drink and control how sweet it is. I also love making the sweetened cream to save me time in the mornings so I can just pour both in a cup and be on my way. My perfect cup of iced coffee is filled to the top with ice, then filled half way with the cold brew coffee concentrate and the other half with this sweetened cream. For a less sweet cup which I prefer some days I’ll fill half way with the cold brew coffee concentrate then a 1/4 of the way with water and a 1/4 of the way with half-and-half. But, it is all about your own preference enjoy as you wish! Less water or creamer will make for an even darker and richer cup of coffee, but this coffee is pretty dark since it has a high concentration of coffee. In a large bowl pour in the coffee grounds and water, gently mix together until all of the coffee is moistened. Cover the coffee brewing mixture and let brew between 12-24 hours (the longer it brews the stronger it will be) at room temperature. Once you’ve strained all of the coffee, pour into covered jars or a covered pitcher until you’re ready to enjoy. Should stay fresh up to one month in the fridge. Heat a medium size sauce pan over medium heat, pour in the milk and bring to a gentle simmer stirring often. Reduce the heat to low and add in the remaining ingredients, stir until combined. Pour into a covered container and refrigerate. Once cooled enjoy along with your cold brew coffee concentrate. *I usually spill some of the brewed coffee when straining, but if you’re careful you’ll have close to 12 cups in the end.